We had a great trip with some amazing anglers over in Chesapeake Bay and New Jersey. 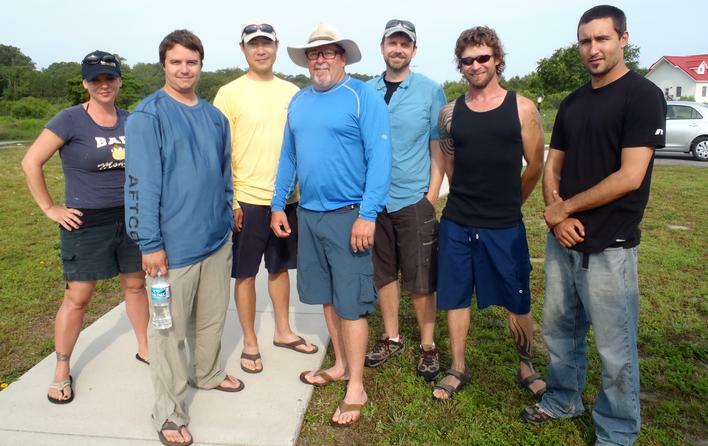 I was about to write up a trip report when I saw that a couple of the guys on the trip, Kayak Kevin Whitley and Rob Choi had already written their own reports on the Chesapeake segment. So I figure best to just show you what they had to say. I finally convinced Jim Sammons and Will Richardson producer of the kayak fishing show to come back to the bay and fish for the big reds and film with us. We filmed with them 4 years ago with the Game On movie and couldn’t catch the target. This time if we couldn’t find the reds, we had backup targets. When we started to talk about dates, i wanted them here a few weeks ago when the reds are predictably in the shallows. This time of year, they can be inside, or out in the deeper water. Those outside areas are out of our paddling range. The date was set for this week, so they could kill two birds with one stone. Jim and Will scheduled a few days with us and then drive up and spend a few days in New Jersey chasing striper. See the rest of Kevins Report Here. I knew about the scheduled visit months in advance but only managed to get out for one of the three days that Jim Sammons was in Virginia. In fact, it was the last day and Kevin had been trying to get Jim on big red drum for some time. When I walked into the lodge, bags upon bags of gear, rods and reels, and big video cameras were all over the dining room table and spreading out across the floor. The familiar face of The Kayak Fishing Show along with the producer/videographer and the narrating voice, Will Richardson, and the full Kayak Kevin crew (Kevin, Lee, Damien & Shante) were getting ready to hit the water. It was an honor to be invited to fish with a legend among legends of this sport. Thanks guys for helping to make this a great shoot of our show I hope we get to fish together again soon. I will follow up with a report from the New Jersey segement of or shoot later. ← Follow us on our trips and get updates on how we are doing.